Most students have to put a major on their applications, but how do you know it’s the right one? And how can you discover other options? The good news is you’re not alone in questioning your choice of major. More than half of UC Davis students change their major at least once. But it’s best to settle with the right one by your sophomore year, especially if you plan to graduate on time. 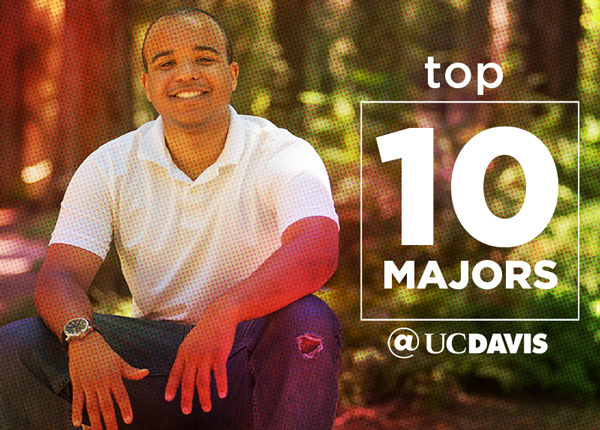 With more than 100 majors to choose from at UC Davis, chances are there’s one that’s perfect for you. Here are some ways to explore paths you may not know exist. First-Year Seminars let you sample interests from cheesemaking to cosmology in creative, one- or two-unit classes. You can take one of these bite-size courses for credit each quarter and broaden your thinking about what is possible in your future. Amazing opportunities to do research are available to UC Davis students. Whether you’re interested in genetics, language and culture, engineering, or design, the Undergraduate Research Center can help you find your way. To sample the possibilities, check out the annual spring Conference on Undergraduate Research, Scholarship, and Creative Activities, where hundreds of UC Davis students present original research. Who knows, your undergraduate research might win an international competition. For her undergraduate research project, Carolina Tavarez-Varela received the Chancellor’s Award for Excellence in Undergraduate Research for her work identifying a language emerging at the border between Haiti and Dominican Republic. During her travels to the region, Tavarez-Varela recognized a need for education and established a school, Ann Prepare Lavni (“Preparing for the Future”). Carolina majored in Spanish, with minors in Latin American and hemispheric studies and in education. She continued her research, going to graduate school in the Spanish department at UC Davis. Job satisfaction is an important factor to weigh in choosing a career. You’ll probably spend a substantial amount of your life working, so choose a field that connects to your core interests and values. The Center for Leadership Learning can help you identify your strengths and passions through workshops, certificates and an annual conference. Consider Dylan Wilder’s story. He had planned on a solid, high-salary career in computer programming. After attending the Center for Leadership Learning’s Undergraduate Leadership Conference, he re-examined his goals and realigned them with his passions and interests. Dylan discovered a major that met his passion for the outdoors. He changed his major to wildlife, fish and conservation biology and is planning a career in natural resource management with the U.S. Fish and Wildlife Service or the National Park Service. Play the major card sort game to discover your interests among UC Davis’ majors. It’s true that you have to pick a major when you apply. But, for both prospective and current students, how many of the 100-plus UC Davis majors do you know about? Did you know you could major in evolution, ecology, and biodiversity? But wait, there’s more. Global disease biology, coastal environmental processes, medieval and early modern studies, sustainable agriculture and food systems, viticulture and enology, and landscape architecture are all options here at UC Davis. The online major card sort lets you play with your options and discover your interests. Academic advisors are great resources, and their purpose in life is to help you find the right pathway to graduation and your future life and career goals. They know things you didn’t know you didn’t know. They’ll ask you questions you never thought to ask. They work with you through your decision whether or not to double major. And they care. Reach out to your academic advisor through your college’s academic advising office. College internships can lead to future careers — or help you discover that what you thought you wanted to do isn't really to your liking. As an undergraduate, Milmon Harrison thought he might be interested in a career in physical therapy, and had an internship at the UC Davis Medical Center. “It turns out I don’t like hospitals,” he said. Now a professor of African and African American studies, Harrison is glad he took the opportunity to make an informed decision. The Internship and Career Center hosts internship and career fairs each quarter, and offers the Aggie Job Link to hook you up with potential employers. To prepare for a life and career you love, take the time to explore our 104 Ways to Make Your Mark. College is the place to discover your future, and UC Davis offers so many ways to try out different pathways to get there. Sharon Knox is director of communications for Undergraduate Education. She shares stories of the intellectual adventures of undergraduates at UC Davis. Sharon has traveled the world; studied at University of Maryland, St. John’s College in Santa Fe and University of Chicago.